While the premiere of the final season of Game of Thrones last night wasn't the most wild episode ever, we did get many long-awaited reunions, and a major reveal was learned by Jon Snow. But arguably the best part of the episode was at the very end, when Bran Stark and Jaime Lannister see each other for the first time since the latter pushed the former out a window and paralyzed him for life—all the way back in the very first episode of the series. Bran earlier on in last night's episode told Samwell Tarly he was "waiting for an old friend" to arrive, sparking fans to speculate who it exactly could be. As Bran is now the Three-Eyed-Raven, he has connections with people across Westeros, even if they don't know it. However, this "old friend" was really someone who wronged him as a child—one who definitely knows who he is. 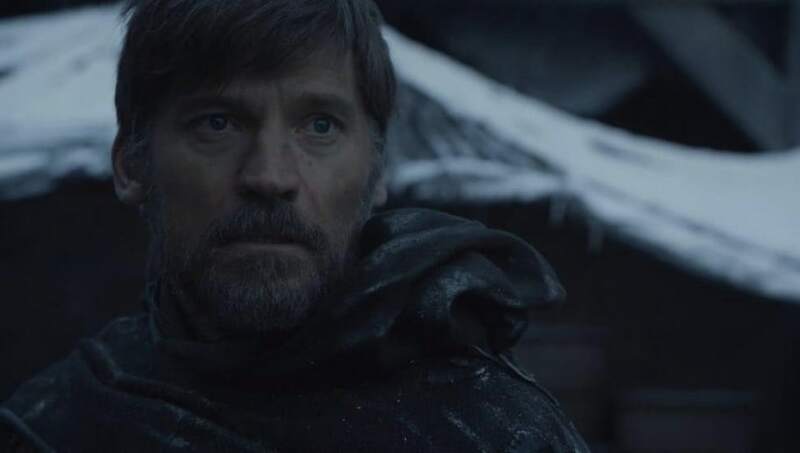 Nikolaj Coster-Waldau spoke with Entertainment Weekly about the moment his character saw Bran for the first time in the Season 8 premiere, explaining what Jaime was thinking in that moment. "First of all, I don’t think wheelchairs are a normal thing in Westeros,” Coster-Waldau explained. “I think it’s like: ‘What the hell?’ and then, ‘Oh my god, that’s the kid.’ I think he knows Bran didn’t die, but he doesn’t expect to meet him." So what's Jaime's plan now? "His mission changes once again,” Coster-Waldau added. “It goes from: ‘I know my brother Tyrion is there and I’m going to fight the good fight’ to ‘I’m in deep sh– now.’ Because this is the Lord of Winterfell that I tried to kill and I’m sure he wants revenge. That’s what Jaime expects." But as for Isaac Hempstead Wright, who plays Bran, he doesn't believe it's all that deep for his character. "In a sense, it's just so irrelevant to Bran, really. His sole focus is that he wants the living to survive. He's on the side of the living. He's the ancient arch-nemesis of the Night King. He's so far beyond any petty squabbling or wanting to get revenge or a comeuppance on someone." But Bran obviously does what something with Jaime. We'll hopefully see exactly what that is when Game of Thrones Season 8 continues with its second episode on April 21.